I arrived in Lyon around noon. I splurged for a Metro trip, that had the added benefit of getting me on the funicular up the steep hill the hostel rests upon. After making my bed, for €12 per night, I visited the Museum of Gallo-Roman History, which was chock full of ancient artifacts, and Lyonnaise history: Lyon was the provincial capital of Roman Gaul. Pretty mosaics. I wandered downhill through the city, keeping an eye out for somewhere I could grab a padlock, or, later on, a decent meal. I found no padlock and I ended up eating kebap, but I did find a book store with a small English section, and thus a replacement for _Catch 22_, and a free map of Lyon from the tourist center. After that I heard some commotion, and ended up wandering the streets with crowds of young French, accompanied by trucks rigged with trailers blasting dance music. From what I could gather, they were protesting new laws that gave the police more power and robbed the people of civil liberties. I wandered along with them, for the hell of it. At one point there was a throng of police down a side street, clad in riot gear. This seemed weird to me, as I’ve never seen such a thing at an American protest – are the French more skull-crackin’ old-school? Nobody I talked to understood why they were guarding such a side street. Then they advanced, and entered one side of the street we were on, which caused some consternation among the demonstrators. It was a tense scene at which my camera ran out of batteries soon after I figured out that the police had advanced in riot gear to form a protective barricade around their station, to fend off whatever harm might be caused by a somewhat anarchistic crowd that was protesting police power. Fair enough. The crowd passed without incident, and proceeded to the park in front of the Perrache train station, at which point the procession turned in to a small rave, an event, with jugglers, a fire-breathing maniac, three different sound systems, and dogs rolling around in the fountains. It was all very funky, and one of the truck managers was kind enough to stow my backpack with its computer for me while I got my dance on. I hadn’t done such a thing since California. I bummed two tokes off an extremely stoned youngster. The party broke up at 19h30. It turns out that I and many others woke up an hour early, because the French came off Daylight Savings Time while we slept. After breakfast, I went with a Japanese roommate, Michiaki, to visit the printing museum, which was extremely fascinating, then another kebab for lunch, and a visit to the conteporary art museum, which balanced out the printing museum by sucking in the extreme. We spoke French the whole way, as we felt more comfortable doing so in France than we did in testing out his English. It all went pretty well. I had a hard time remembering what I’d shared walking and talking Michiaki that I had not already shared in a long French conversation with a pair of young Japanese cuteys back at the hostel the evening before. It was all good, though. Well, except for the contemporary art museum, which I repeat, thoroughly sucked and was without the slightest shred of redeeming value except for the big dark room that was interesting for its sensory deprivation. Next to the contemporary art museum was a movie theater which was playing Michael Moore’s new movie, “Bowling for Columbine” in English. I went and saw that, while my companion went his own way, since he didn’t feel comfortable with the idea of following a movie by reading French subtitles. The movie was a grand dialog about contemporary American society, concerned with the roots of our epidemic problem of gun violence. He managed to keep from getting preachy and self-righteous, sticking to his strength of trying to offer and sympathize with all points of view. The result, in my opinion, was nothing short of fantastic, and if you have the opportunity to see this film, I strongly encourage you to do so, preferably with a group of friends or loved ones that you can share an interesting conversation with afterwards. The image of NRA President Charlton Heston, Moses himself, retreating uncomfortably from the image of a six year old girl who was shot and killed by her six year old classmate … well, it is a classic moment. Priceless, and filled with complex, genuine emotion. I loved it! 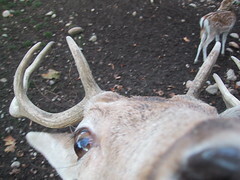 Inquisitive deer inspects camera to determine edibility. After the movie, I walked through the park where the cinema and the museum were located, snapping some fun pictures of deer they had in the park along the way, after visiting a greenhouse. I walked clear to the other side of Lyon to visit the Urban Museum, which was closed by the time I got there at 1800, but seemed to consist primarily of giant, outdoor murals, half of which were missing their interpretive signposts. I purchased une demi-baguette, some confiture des fraises, and a pastry to snack on back at the hostel, with the juice and cheese I’d bought the night before, whilst updating the journal. On the way back, I discovered another, cheaper theater, that was closer to the hostel, and was playing “Signs” in English. After that, I found a place just down the hill from the hostel, that would sell me an Internet hook-up for €3 per hour. By dinner, I had the next days itinerary set up: Fine Arts Museum, movie, Internet access, and laundry. Yay! I visited the Fine Arts museum with Michiaki. That took about two hours. Not bad. Lunch, then we found the national bank where Michiaki was able to exchange some old Francs for Euros, then we walked down to Perrache, en route to the theater, where he was able to cash in some of his Franc traveler’s checks at the Thomas Cook exchange office. We bummed around the movie theater for an hour before show time, my companion still somewhat fatigued from jet-lag, having arrived just four days earlier. He joined me for “Signs” which was a very silly, but otherwise pretty good flick. Michiake explained that he understood about two thirds of the French subtitles, while I thought about how the movie represented the American sense of fear based in alienation, a strong theme from “Bowling for Columbine” the day before, and wondering quietly whether this particular fear from alienation was representative of Fear of the Unknown Terror(ists), or simple old-fashioned Fear of the Black Man. It could just as well be Fear of Technology, but that would be too obvious, after the younger brother goes on this tirade about how this is all just an elaborate hoax perpetrated by thirty year old men who never got to have girlfriends, the Nerds, who are able to orchestrate hoaxes on a more massive scale now thanks to the Internet, simply because they never have anything better to do. Okay, perhaps Signs is a great movie. Afterwards, I dropped anchor at the Internet cafe I’d found the day before, Caps Lock, just downhill from the hostel, and checked in on my own elaborate hoax, after which I enjoyed a chicken basmati at the Gandhi restaurant a few meters away, across from the Funicular station. Great service. Not horrible prices. Back at the hostel, laundry took only two hours. I saw that the wash was available in an “eco” version, which, after Hamburg, I carefully avoided. Wash took an hour and a half, and a half hour more to dry. I napped for half-hour intervals, and during one of my “check-if-the-laundry-is-finished-yet” runs I found myself in conversation with a Taiwanese girl, drying her hair in the stairwell. She was considering the Contemporary Art Museum, the Lumiere Museum, and the Musée Urbain Tony Garnier. I discouraged her from the first of those, and was tempted by the latter two, not to mention the companionship, and the savings from another day at the €12 hostel. I decided to sleep on it. When I ran into Yiling at breakfast, I still felt ambivalent about whether I wanted to press on, or stay another day. I returned to the room and packed everything up, but as I’ve been carrying my small bag around with little more than the laptop, you know, for security, and I couldn’t easily fit everything else into the larger bag to store it while exploring town, it was either stay or go. The towel was still damp from my shower late the chilly night before. I went downstairs to meet Yiling and pay for another day. Yiling had met up with another Taiwanese girl, Emily, who is a student, staying at the hostel while waiting for student housing. We walked downhill with Michiaki, who travels fantastically light, and who was headed to the train station for his next adventure. Emily and Michiaki spoke with each other in French, while Yiling and I conversed in English. Yiling had just finished a one-year Master’s program in London. Michiaki had just given me his contact information in Tokyo. Once we saw him off, I noted with a smile that we had a language triangle, as the girls knew Mandarin, and Yiling spoke English with me, while Emily and I shared French. We took Yiling’s bag to a locksmith, who cut the defective combination lock off of it, and I finally got to purchase the padlock I had been seeking. After that, we visited the Lumiere Museum, which was fairly interesting, especially the old school color prints, that had a bit of a pointillist feel about them. I was reminded again about how all the museums have tended to play up Lyon’s important role in history, and felt a bit of kinship at the whole sense of civic pride that Chicago has been known to derive from its own “second city” insecurities. After Lumiere, we saw Emily off, who had to get to class. Yiling and I had a cool lunch in a little working-class place which served copious quantities of frites with the food. We ate at a liesurely pace, as I answered Yiling’s questions about how Americans felt about George Bush and the environment and Yiling answered my questions about how Taiwan feels about itself and China. I explained that most Americans, even if they didn’t vote for him, were inclined to suffer through his presidency without too much complaint, because there was only so much damage he could achieve in four years, compared to the trouble it takes to change a government that one is less than happy with. The environment? Many Americans aren’t inclined to worry about it, and those of us who are, generally don’t see it as worth beating our heads against the wall while our little oil prince is in power. The environment takes time to affect, and the few years that George has left at the realm aren’t going to make a really big difference. Yiling explained that the Taiwanese people, especially the youngest generation, see themselves as a people distinct from China. She explained that, for example, when traveling abroad, the whole “Taiwan is neither China nor is it actually a nation thing” is at best, an irritating nuisance. In Taiwan, she said, Identity is very important, how Taiwanese see themselves, to such a degree that Nationalist fervor has become something of an annoying litmus test at all levels of politics. The ultimate question was whether it was worth risking War … blood … would you die for the idea of Taiwan? Yes. And I hope that if it comes to that, you will help us. I offered my opinion that, given our own history, the United States would be morally obligated to support the will of the Taiwanese people, if that were there will. I talked about what great personal risks our own founding statesmen took in staking their lives on Independence, relaying the old “my only regret is that I have but one life to give for my country” and explaining how “John Hancock” had become synonymous with signing your name to a document. It turns out Yiling is merely a month older than me. Taiwan’s fate will probably be resolved in our lifetime, and it is something we are all likely to remember. In a larger sense, how China manages or fails to care for its billion people in a sustainable manner, along with how we all manage the environment … well, these are some of the really big questions that our generation is going to have to answer. After lunch, we trekked over to the Tony Garnier, which is actually a set of twenty-four outdoor wall murals, depicting Garnier’s vision of the “Industrial City” around 1900, which featured then-novel things like zoning different areas for different use. His plans were detailed, and utopian: the houses should look like this, the train station here, the hospital, designed in sections, up on the top of the hill, hydro power. Lyon implemented a small part of this in a modified form, along the Boulevard Etats Unis, or “United States Boulevard”. The utopian intentions were a fascinating dessert to our worldly lunch discussion. Along the way we ran into an old Vietnamese lady, and an older Hungarian man, both polyglot ex-patriots who haven’t returned home since the wars that separated them from their childhood homes. I was glad I’d stayed another day.